One thing we all have in a limited quantity is time. How are we supposed to get everything done each day? Especially when we are trying to take care of animals and gardens on top of everyday life! The only way to keep so many balls in the air is to do some pre-planning! 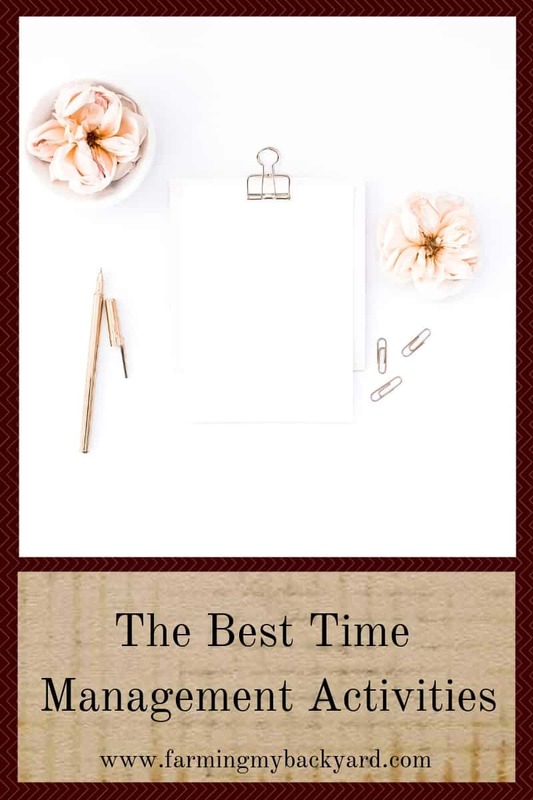 Here are the best time management activities for urban homesteaders. Don’t waste your time, because it’s precious. Are You Discouraged? Homesteading Can Be Tough! Sometimes what helps me is to a do a big brain dump and write down everything that needs to be done. Get it all down onto paper! Once it’s all written out in one place look at what’s on your plate and decide which things are the most important to you. Next identify the urgent things. Decide which of those urgent and important things need to be tackled first, and make a goal to take care of those things. We moved last year and one of our top priorities in this new house is to get gutters and downspouts to carry water away from the south side of the house where it backs up. If we didn’t decide that was the first priority it would be easy to get side tracked with all the other awesome homesteading projects we’d like to do. Now that you know what your goal is, it’s time to reverse engineer. What needs to happen before you can get that item off your to do list? Think of the steps all the way back. Now you have your “next step.” What is the very next thing you need to do to make progress on your goal? Do that thing! For us the first thing meant getting a quote and deciding if we would hire someone or try to do it ourselves. We also had a few minor roof repairs that would need to happen first. By looking through all the steps before we started we were able to make a plan and a budget for the project. Once you’ve done one step to reach your goal, you should have a pretty good idea of what the next action you need to take is. Before you finish up, decide what your next action will be. Sometimes we waste a lot of time thinking that we really should get started, but not really knowing what thing to start with. It’s a lot easier to get moving if you know where to start. One example of this is my husband and I need to clean out the cracks in the sidewalk in front of our house and fill them so we don’t have a mega grass jungle that require weeding in 100 degree heat this summer. As he put the tools away, I opened up the calendar and we picked a time to head to the hardware store to buy the crack filler stuff. Another helpful idea is to write that next step action right into your calendar. If you have one master calendar that you consistently use it’s easy to see at a glance when you’ll be able to next tackle a task. Personally, I use google calendar because it syncs with my phone and laptop, and my husband and I can both add to it wherever we are. I used to think meal planning was too difficult, until my husband pointed out that we could meal plan in the car together on Sunday afternoons when we drive to visit my parents and write it down in the calendar on the time slot where it’s time to cook dinner. I don’t know WHAT I’ve been doing all these years, because this has been brilliant. Not only do I know what’s for dinner, but my phone pops up a notification for me when it’s time to get started. I even copy and paste any recipes I need right into it. You don’t have to use a digital planner or calendar, you just need to be consistent in using it. Put your calendaring time into your calendar so you don’t skip it! Using a calendar is probably one the most useful time management activities you can do for yourself. Once we started doing this, it becomes really obvious when we don’t follow through, too. We know we need to buy that crack filler stuff, but it’s not on the calendar, so we still haven’t actually DONE it yet! Another way to save time is by doing similar tasks together at the same time. Some examples of this would be doing a week’s worth of meal prep in one afternoon or evening. You mess up your kitchen once by doing all your chopping, peeling, mixing. You only have to clean up once, instead of every single night. Batching also works for mental tasks too. It takes time to focus on an activity, so you’ll get more done if you don’t have to switch gears mentally. I’m sure we’ve all experienced that sense of flow, where you lose track of time because you are so absorbed in an activity. Experiencing flow is one the most productive ways to work. You can maximize the chances of that happening by planning not to be interrupted. You may feel like you don’t have time to fit anything else into your day. And that may very well be the case. However, chances are you have the time if you make it. Sometimes that means replacing one activity with another one. For example, I could be watching Netflix with my husband right now, but instead we made a different decision. I wanted to write this post, and he wanted to catch up on some work for his tax clients. It’s also a good idea to evaluate where you’re spending your time. Sometimes even quality activities can distract us from our goals. One time management activity to try is make a list of 10 things you did yesterday. Next, list your top goals on the other side of the paper. Draw a line from the 10 activities you did yesterday and connect them to the goal they will help you to reach. This is a great activity even if you are focused on your goals, because it can encourage you that you are in fact making progress daily, even when it may not look like it. On the other hand, if none of your activities are getting you closer to your goals, it may be time for some major adjustments! Another way to save time is to get organized. When you streamline your space you also streamline the time it takes to do a task. It’s a lot easier to feed the chickens if your chicken feed is stored nearby in a metal can and there’s a spigot to get them fresh water. It’s a lot easier to go outside in the cold to gather firewood if all your outdoor gear is in one place instead of spread all around the house. Store things where you use them. Give everything a place of it’s own. Get rid of excess. Make your surroundings work for you, and it will save you time. Sometimes it’s nice to have a little downtime with something that’s not really productive. That’s a great time to use an hour glass or timer to help you not lose track of time. Fifteen minutes can easily turn into an hour if we’re not paying attention. On the other hand, setting a timer can also motivate you to work for a few minutes on an unpleasant task. This is often how I managed to muck out the goat yard. I’d commit to doing just fifteen minutes in the morning. When my timer beeped, I went back inside. Just a few minutes each day adds up to a finished project rather quickly. Another great skill to learn is to do your most difficult task first. If you can get your most dreaded activity over and done with, you’ve already had a productive day! Oftentimes this is something urgent and important. Without those big ugly tasks breathing down our necks it’s a lot easier to feel a sense of enjoyment in our other tasks. It’s also easy just to putter the day away without accomplishing much. Anyone who has worked afternoon shifts in a job probably knows this. When you go to work first thing in the morning when you get home, you have the whole rest of your day ahead of you. When you work later in the day the morning hours just kind of expand into getting-ready-to-go-to-work time. What are you dreading the most? Get it done. Get it out of the way. Of course doing the hardest task first doesn’t necessarily have to mean first thing in the morning. Perhaps it’s the first thing you do after the kids go to bed. Maybe it’s the first homestead task after you get home from work. If you understand your natural rhythms you can use it to be most productive. Plenty of people say to wake up early in the morning to get more things done, but I’ve found the opposite is true for me. If I wake up early I’m grouchy and groggy and my brain isn’t functioning, no matter how early I went to bed. On the other hand, I can happily stay up a little later to get some writing in, even when it results in the same number of hours of sleep in a night. Humans are naturally sensitive to light as well, so getting outside in the sunshine first thing in the morning can make it easier to sleep at night. Play around with when you get outside to get your gardening done, when you devote time to physically intense projects, and when it’s time to do more mental activities until you find out when YOU are the most productive. Sometimes the best way to maximize your time is to stop spending it on certain things. Some things are just not worth the time it takes to do them. That’s okay! Everyone is different! Something that may be a great fit for one person may just not be your thing. It was really hard for me to decide to stop raising goats. I really did enjoy my goats, but ultimately they took a lot of space on my tiny homestead and a lot of my time. That time and space could be a lot more productive with other things. Sometimes you decide to give up something you like for something even better. It can be hard to say no, or to admit you’ve made a mistake. It can be really important though, so when it’s time to stop, go right ahead. Let’s pretend you recently received a windfall of $86,400 (after taxes!). What would you do with it? How would you decide what you want to do? What kind of goals and dreams would that help you reach? We all have 86,400 seconds given to us each day. How are we using those seconds? Are we using them to reach our goals and dreams? Don’t just fritter them away mindlessly. Sometimes we don’t realize how precious our time is because we count on having all our tomorrows. But just like a windfall of money, once that time is spent it won’t return. Invest those precious seconds into the things that really matter to you.